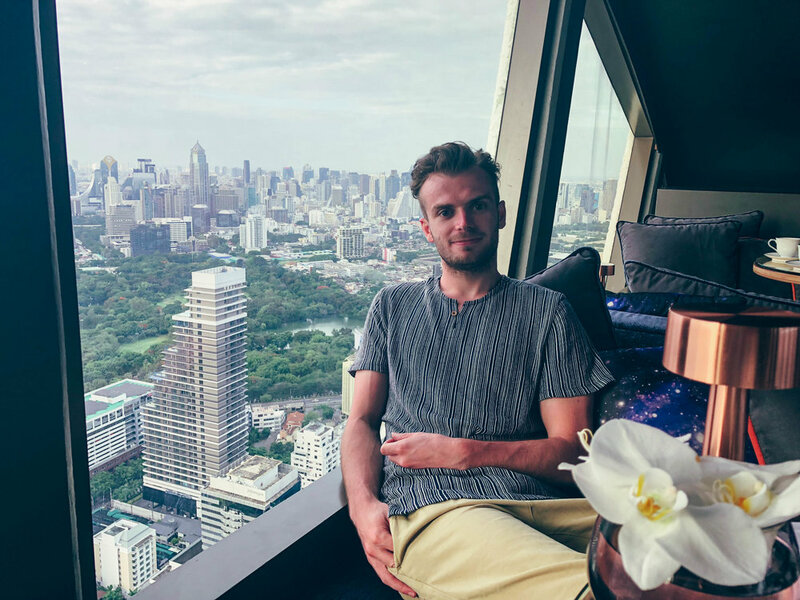 As Banyan Tree Group is one of the top end most luxury hotel chains in the world with hotels in over 14 different destinations - you can imagine that I was screaming with excitement. 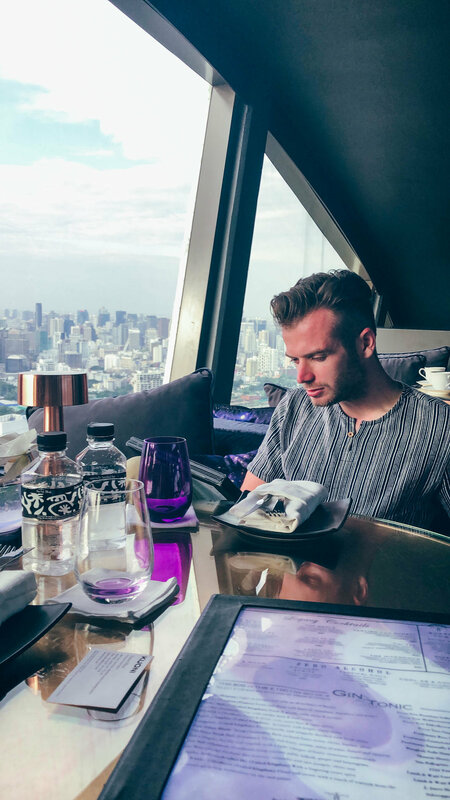 After my exhausting day of sightseeing Bangkok In 24 Hours my boyfriend and I took our tuk-tuk to the front steps of the hotel’s grand entrance - quite embarrassing as mostly limos and Bentley’s were pulling up front! We were met and greeted by the concierge to be seated in the lobby for a few minutes. The service from the offset very VIP style with great attention to detail from the beginning. We were offered a welcome drink and then escorted to the indoor, air-conditioned bar Vertigo TOO to have more drinks! 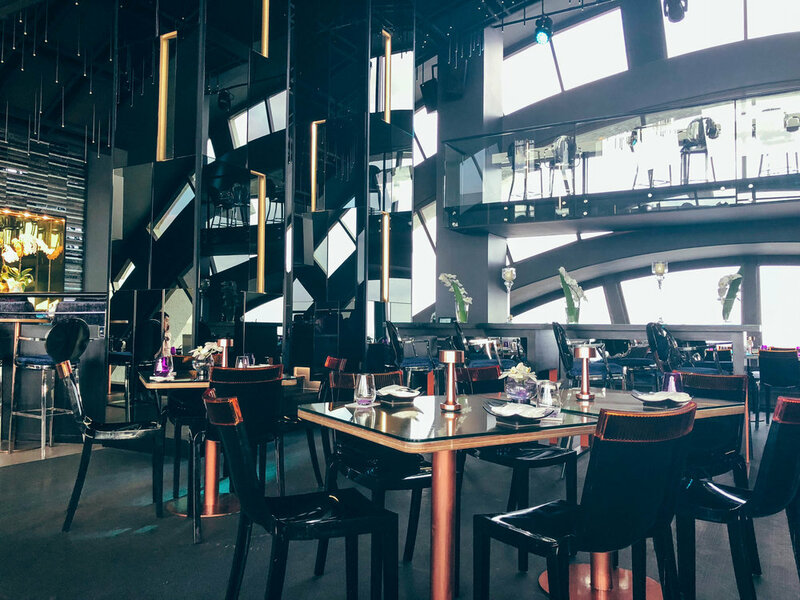 This bar is located on the floor beneath the famous rooftop elevated Moon Bar and Vertigo restaurant with plump leather poufs and purple satin cushions. 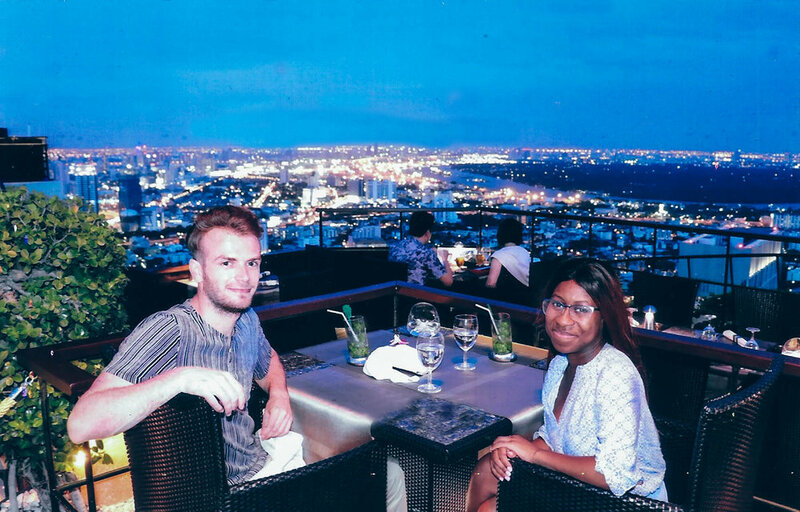 We spent time here listening to live music, enjoyed spectacular 60th-floor views and enjoyed some nibbles and cocktails. 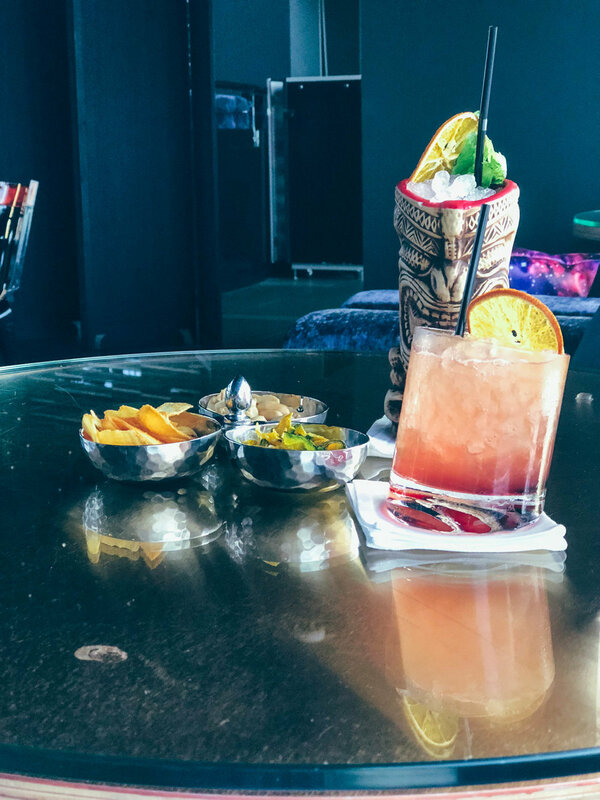 The premium drinks, such as the classic Vertigo Sunset which has a melody of pineapple, cranberry and lime juices blended with just the right amount of Malibu. In general the mood was ambient with decorated arched ceilings and canopy of lights mimicking a starry night just after as the sun was setting over the city. I really felt on top of the world. 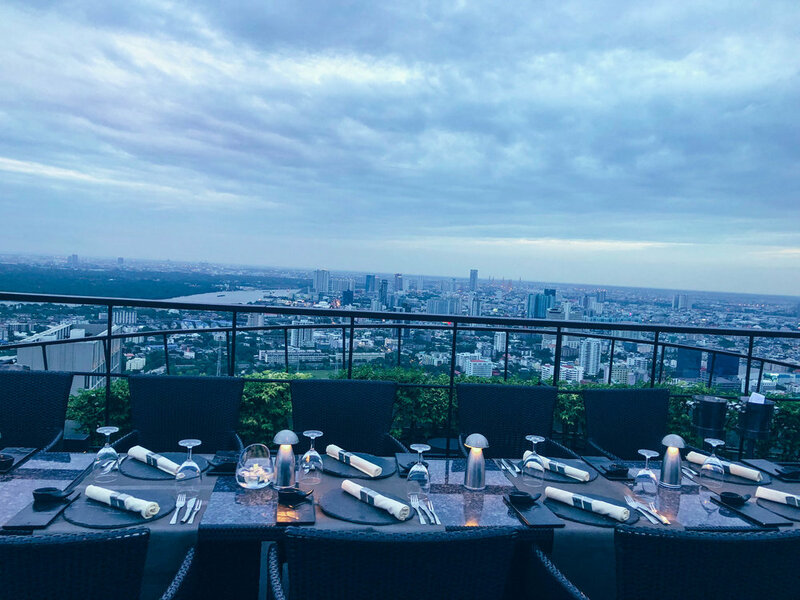 We were then invited upstairs to dine at the Vertigo restaurant, overlooking the skyline of Bangkok — now these views say it all really. I’ll let my photos do the talking! I can’t even put it into words how incredible it - simply blown away! 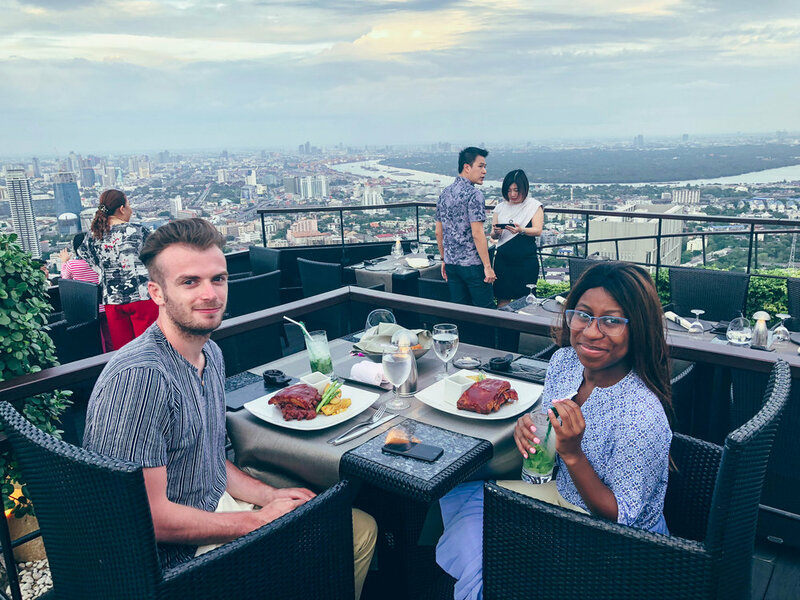 I highly recommend that you reserve and book a table in advance, especially if If you have something to celebrate whilst in Bangkok, an anniversary or birthday, you really have to go to Vertigo. 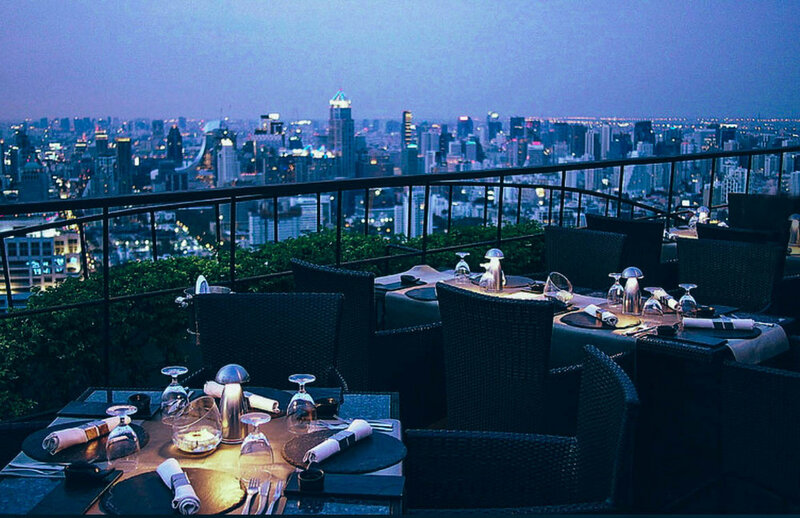 Watching the sunset over Bangkok, the twinkling lights below in the distance, even witnessing the atmosphere of other sitting on the tables nearby. It was something quite special. On to the food - now what can I say the bill did set us back to a whopping £138.00 for 2 with 1 additional drink each. I felt like a hole was burnt in my pocket! Rest assured, this was one of those moments where you could laugh or cry and I chose to laugh. The restaurant offers al fresco dining and the menu is endless with a list that even had seven courses, ( yes indeed, I repeat 7), I’ve never seen a list so long. We opted for the simplest *inserts a cough here* and cheapest dish on the menu. A delicious baby back bbq pork chili rib with potatoes. To my satisfaction, it went down a treat and was definitely full by the time I had cleared my plate. I kept saying over and over, “That was so good!” You can choose from the grille, seafood & sushi, tea cakes & sweet treats and a range of artisan fine-dining, of course. If you’re looking for the classic beef burger and chips, that’s also available too! A little souvenir from Vertigo and Moon Bar for us to bring home was a picture of us together to remember our experience (see photo above). They went around taking photos of all guests and developed the photos for each table, which I thought was a really nice gesture and a lovely way to end our last night in Bangkok. There are two timings for dinner, the first one is 6 pm to 8 pm, the second one is 8.30pm to 10.30 pm. Strict Dress Code: Smart Casual - no slippers, flip flops, athletic apparel, torn clothing or even backpacks are not permitted (I had to shove mine under the table in which they then bought a stool over to place my bag on - fancy right? Boys make sure you are wearing long trousers, closed shoes, and sleeved tops! 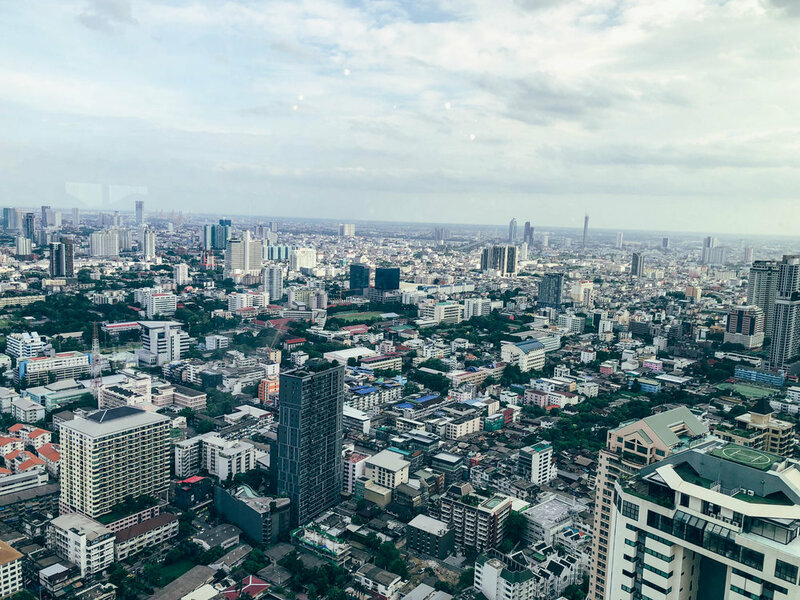 So where do you think is the most beautiful place for a view over Bangkok’s Skyline? Daffy Daydream started off as a place to keep images of my daily outfits, now Daffy Daydream shares inspiration from my style now to the outfitting whilst travelling. Inspiring others to see the world and dressing accordingly too - with your own unique approach! I now spend my time between adventures abroad and wearing out my wardrobe. Welcome to Daffy Daydream! Whether I'm traveling around the world or hanging out in my hometown; I'm doing it in style. I document my adventures in fashion and travel. Hope you have a nice stay! Never miss out on a blog post updates, exclusive travel guides, style tips, and giveaways and of course all things travel and fashion - it's free! I promise to never spam you unless there is some form of delicacy involved or a deisgner label up for grabs - Gucci anyone?